The great and modern looking, 4′ x 6’1 Palram Amber 46 Skylight Shed is a very simple and low priced way to add some storage to your garden. This is a shed which thanks to its design does not require a large garden to be stored in. 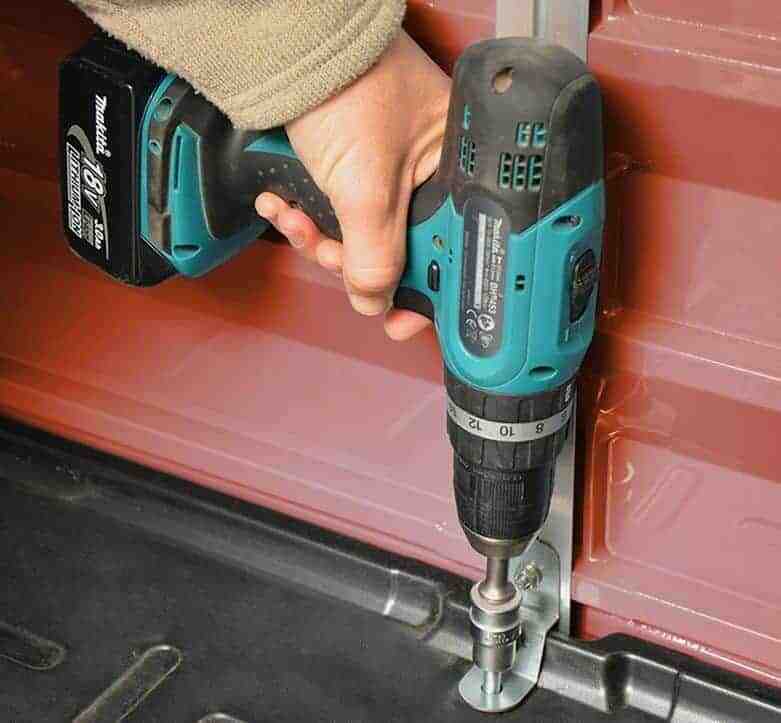 It will easily fit in smaller gardens and still offer you a good amount of space to keep things like a lawn mower and your garden tools safely away from the bad weather. It has a look that resembles a workshop and because of this it will be a structure that stands with pride in your garden and is sure to be something everyone asks you about. This is a shed which has just a wonderful looking design, but the materials which are used make it one very strong, reliable and long lasting shed which requires very little from you in return. High impact polycarbonate panels have been used to construct the shed and these will keep out the rain and be able to take a lot of abuse over the years. A high quality apex roof adds to the pleasant look of the shed, but also serves as protection from the rain and snow. One huge bonus of this shed is that it requires no annual treatment and next to no upkeep from you. 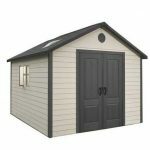 This line of storage sheds from Palram is something that we have been very impressed with and this model here is just ideal if you do not have a large garden, but are just desperate for a bit of storage space to keep things safe and stored away properly. You have right around 4 feet of width and 6 feet 7 inches of depth. These dimensions are more than enough to fit in a lawn mower and a whole load of other items such as gardening tools or even some of the kids outdoor toys that you are sick of laying on the lawn. The height is very impressive with the ridge being 6 feet 7 inches high. This is actually higher than most other sheds of this size so this is something we really do like as it makes going inside the shed much more comfortable. 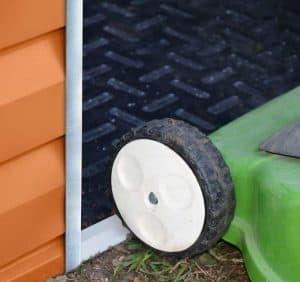 The lowest point of the shed along the sides is still 5 feet 8 inches high which gives you enough room that you could stand some shelves up against the wall. Palram have gone with an apex roof which gives you all that extra headroom inside of the shed, but it is also just perfect at keeping the rain out. We love the way that the roof has been made from this very durable and very good looking, UV polycarbonate panels. They offer just as much protection as you would get with roof and felt, but require no maintenance at all. While at first glance and from a few feet away you may actually think that the 4′ x 6’1 Palram Amber 46 Skylight Shed is made from some kind of wood, the walls are actually something very different. These are high impact polycarbonate panels and we really are impressed with just how high quality they are. They are made to help keep the cost down, but also provide a set of very strong set of walls that are going to last for many years. We will admit that from the outside we were not sure to expect when it came to the frame as we have seen sheds similar to this that actually do not bother with one. Well Palram have not only put a frame inside here they have actually used a very lightweight, but strong aluminium frame. This really does give the shed a set of bones that are strong, so strong that the shed is never going to get weak or start to get a bit on the flimsy side. The polycarbonate flooring which is used inside the shed is very interesting. It has a unique look to it, but it is also very practical in a number of ways. First of all it makes for one very durable and reliable floor which can take a great deal of weight. Also it makes cleaning it very easy. You can just simply wipe up anything that you spill in here, clean up mud, grass or anything else that gets on it, much easier than you could if it was made from wood. 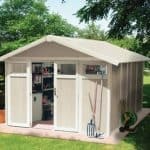 One thing that we are surprised Palram do not brag about more with this shed is just how low maintenance it is. We are not exaggerating when we say that once built, you do not have to lift a finger in order to maintain it. There is no coating of treatment you need to do or anything like that. At the very most you may want to give it a wash with the hose if it gets a bit dirty, but that is all you will ever have to do. Giving you a ten year warranty just shows how long lasting and top quality these materials are. We feel that this is a shed which could easily last twice that amount of time and not look a day older than when it was first built. We love the door on the 4′ x 6’1 Palram Amber 46 Skylight Shed as it does stand out and add to the character of the shed. 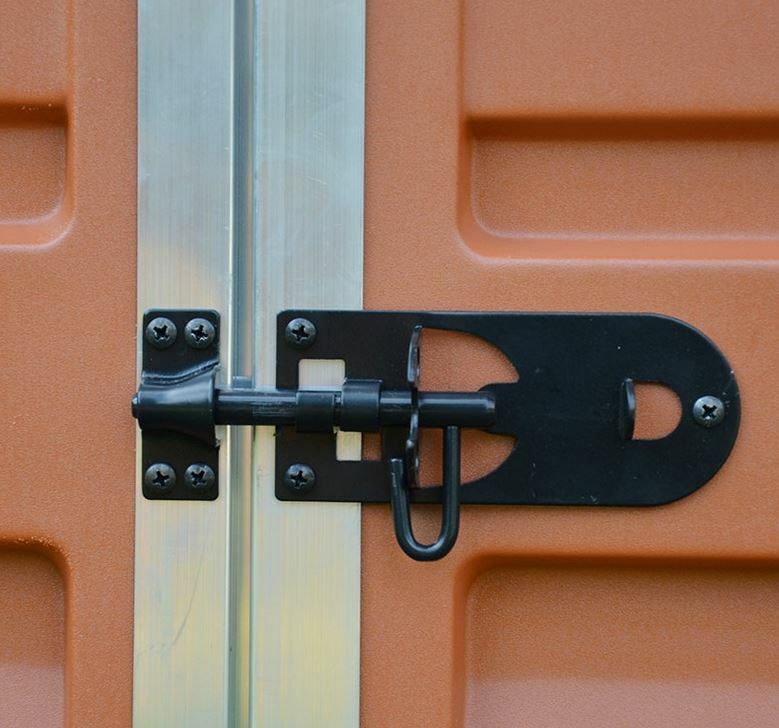 This is a single door, but at 5 feet 7 inches high and 2 feet 1 inch high, you are going to be able to get things in and out without any trouble at all. The door has this fantastic looking silver trim to it which we know adds nothing to the functionality of the door, but we do think it looks good. 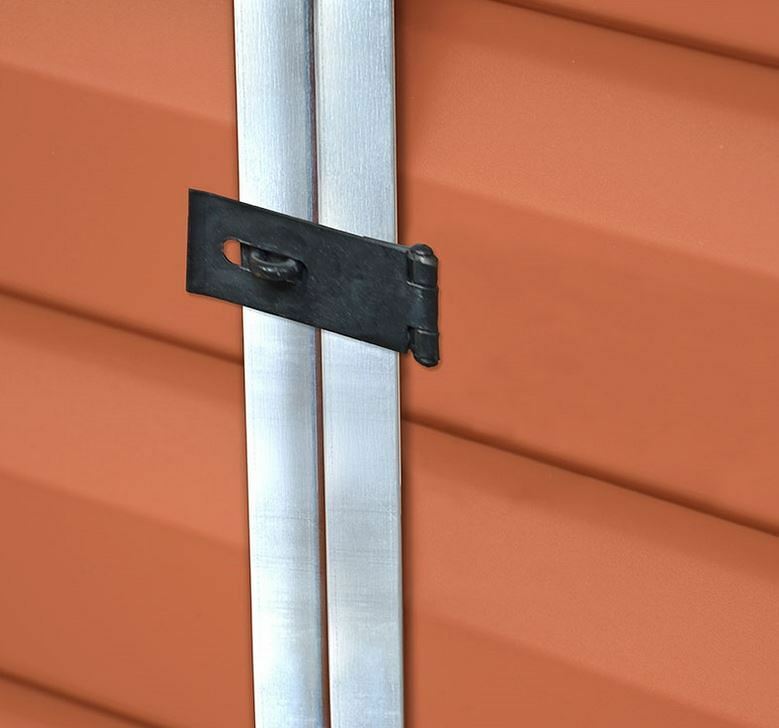 Palram have used two very strong hinges to make sure this door will stay in place for the life of the shed. The type of materials which are used for this shed do not allow for windows to be easily added so Palram have gone for a windowless design. 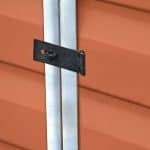 When the door is closed this is one very secure shed, but as solid as those polycarbonate panels are the door does not come with any kind of lock. It does have a latch so you can close it, but if you want to keep your items locked up at night then you will want to buy a padlock. Luckily there is a space on the door latch to put a padlock so it is easy to do and will not cost you more than a pound or two. The lack of windows and the secure door do mean that when it is all closed up there is no way to see inside. 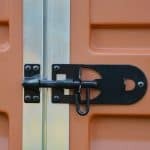 This makes this a very private shed so your belongings will be kept out of sight at all times. This has a very cool and modern look to it that we feel will go well in any style of garden, which we are very pleased with as there is not anyway to change the colour of the shed. But the space inside does allow you to flex your creative muscles and design the layout just how you want. Thankfully there are no pricy hidden extras that you need to buy in order to get the best out of this shed. The only thing you will really need to buy is a padlock, but with how cheap they are that is not something we see as a problem at all. This is one very impressive shed and its high quality comes from the incredibly durable and top quality polycarbonate panels. One thing we are sure that many of you are going to love about this shed just as much as we did was not only how long lasting the materials used are, but also how low maintenance they are. 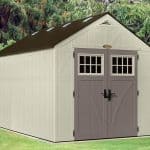 This is not the largest shed in this line, but it does give you some good storage space to make use of if you are clever with the way you lay your things out. 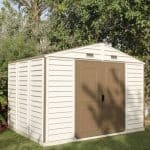 With a friend helping you out, we think that you should have this shed all slotted and screwed together in just a couple of house. When it comes to installation this is one of the easiest sheds we have seen in quite some time. 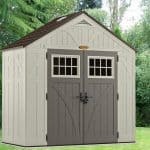 We honestly believe that this shed is one fantastic deal. Not only because of how it will allow you to keep things tidied away, but because of how it will easily last you 20 or more years. 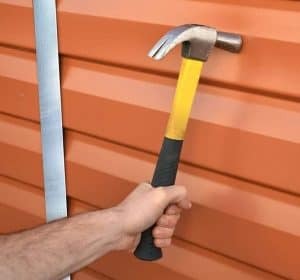 Final Thoughts: We have noticed more and more people want a shed that is offering something of a modern look that also requires very little maintenance. Well that is what you get with the fantastic, 4' x 6'1 Palram Amber 46 Skylight Shed. 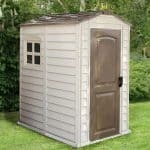 It is a great compact shed which will fit into any size of garden and give you that extra storage space you need. It provides you with that extra storage space, but it does it with some real style and also with a price tag that we certainly feel is very reasonable. 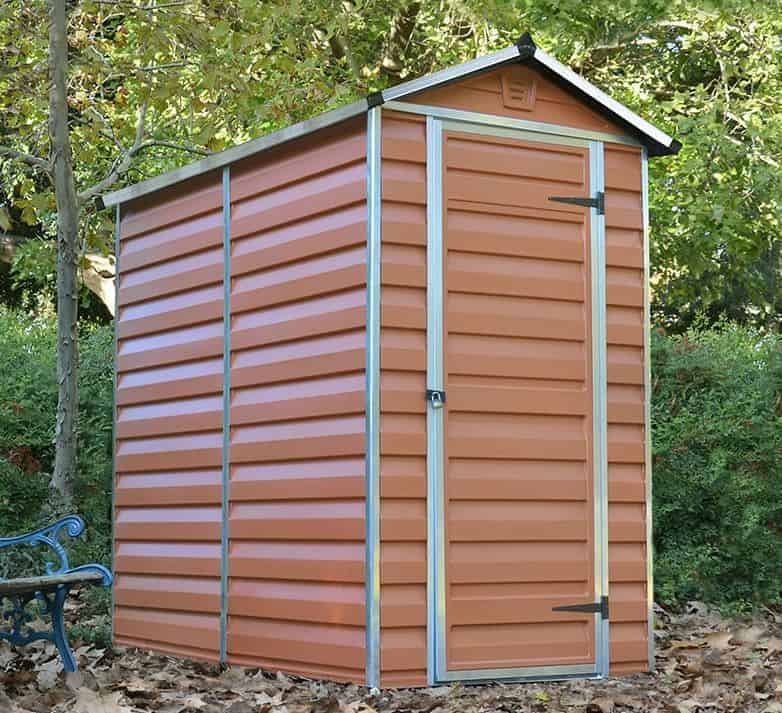 No matter your reasons for buying this shed be it storage for your gardening tools or even as a place to keep the kids toys tidy, we are confident you will be very happy with this and even more so when many years from now it is still in your garden doing just as good a job as the day it was built.